They say you eat with your eyes first. You can take the most humble ingredient and raise its level to stardom with just a little care – presenting, the beet. I had this for dinner at restaurant 26 North in Bergen, Norway. The beet were roasted and raw and their earthiness contrasted nicely with the goat cheese, crunchy walnuts, and piquant pickled onions. Plus it was a colorful joy to look at. How much time do we take at home making our food look beautiful? Not enough! 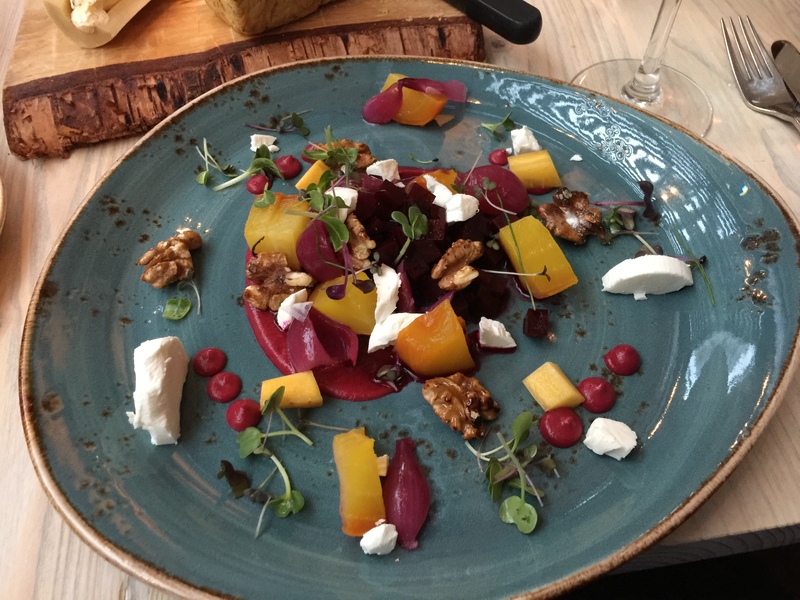 This entry was posted in Dining out, Vegetables, Vegetarian and tagged beets, goat cheese, Golden beets, Norway, Onions, walnuts. Bookmark the permalink.